Soccer might be the most popular kids' sport in the USA. Learn the basics. Kids' soccer is so prevalent, playing is almost a rite of passage for American children. And of course, the game is popular among fans all around the world—even more popular than it is in the United States! While it seems like every kid takes a turn on the field, is soccer really right for your young athlete? Make an informed decision. Soccer (called "football" outside the United States) is played on a rectangular turf field with a goal at either end. Teams compete to place a ball into the opposing team's goal. Players must use their feet, heads, or torsos to propel the ball; only the goalkeeper can use his or her hands or arms to stop the ball from entering the goal. Boys and girls both play (often on coed teams when they are young). Age kids can start: 4 (American Youth Soccer Organization); 5 (US Youth Soccer Association). Some cities or recreational centers may offer soccer programs for kids as young as 3; the game is easy for kids to pick up at a young age. Season/when played: Spring, summer, fall; year-round in many areas; indoor soccer leagues are also available. The game is slightly different when played indoors (officially, it's called "futsal"). Team or individual? Two teams of 11 players each; short-sided teams (with fewer players) are common for children under 10 and allow more playing time for each child. Levels: Age-grouped and school-affiliated teams, up through high school and college. Starting as early as age 7, kids in many areas have the option to play in either a competitive (traveling) or noncompetitive extracurricular league. Talented players may be selected for elite leagues, training camps, or development academies. The best players can play at the Olympic Games, in the Men's or Women's World Cup, and/or on professional teams in the U.S. and around the world. Appropriate for kids with special needs? TOPSoccer (USYSA) and VIP (AYSO) are leagues for kids with physical or cognitive disabilities. Children with severe asthma or other chronic health conditions may have difficulty participating. Fitness factor: High. All players except the goalie spend most of the game running. Coaches should encourage every child to have lots of opportunities to play during practice and games. At practice, all players should have their own balls to use in drills). Soccer builds aerobic fitness, leg strength, and balance. 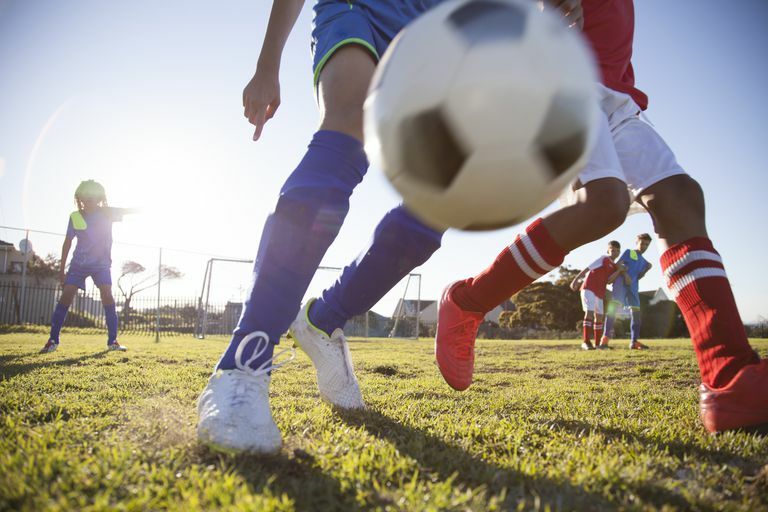 Equipment: Soccer shoes with rubber or molded plastic cleats, shin guards (look for the kind with built-in ankle protection), uniform, ball (smaller, lighter balls are available for younger children). Costs: League fees (up to $150 for noncompetitive leagues; $700 or more for travel teams), equipment, tournament fees (varies significantly, but can reach $500 per tournament per family including fees and travel expenses). The time commitment required: For the youngest children, an hour a week (30 minutes practice, 30 minutes game). As players move up the ranks, practice time and the number of games increases significantly. Players on competitive teams will travel longer distances to games and usually attend at least one out-of-town, weekend-long tournament per season. Some former pros, schools, and physicians are now recommending a "no headers before high school" policy. This may help kids avoid some concussions. However, players can also sustain concussions from collisions or falls, so parents should be aware of symptoms and recovery procedures. If your child likes soccer, also try: Basketball (similar pacing), field hockey or lacrosse; ice hockey or water polo. Smith NA, Chounthirath T, Xiang H. Soccer-Related Injuries Treated in Emergency Departments: 1990–2014. Pediatrics. 2016;138(4).